Retired Olympic track and field athlete Hollis Conway will be speaking at the Student Union Theatre on Tuesday, March 15 at 1:00 p.m. to deliver a message of inspiration to the students and adults who are attending. His talk, titled “Overcoming Obstacles: Reaching Your Maximum Potential” will get into what he had to do in order to become as accomplished as he is, and what some of his biggest challenges were along in the process. Conway worked hard and made it to one of the most difficult athletic competitions in the whole world, the Olympics, not once but twice in Barcelona and Seoul. His speech will surely be one of the main highlights of the year and will be a relevant talk to anyone who feels the pressures of life from time to time. The Chicago, Illinois native made a name for himself during his college years when he won the NCAA Men’s Outdoor Track and Field Championship in 1989 as a representative of the University of Southwestern Louisiana. 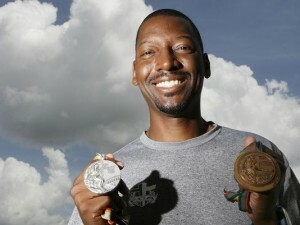 The six-time NCAA All-American and three-time NCAA champion entered and won gold medals at both of the 1991 Sevilla World Indoor Championship and 1991 Sheffield Universiade tournaments, in addition to taking home a silver medal from the 1988 Olympic games and a bronze from the 1992 Olympic games. In his event, the high jump, Conway, Dwight Stones, and John Thomas are the only Americans to win two medals at the Olympics. Conway will be speaking on March 15 at the Student Union Theatre and is expected to bring in a lot of listeners to come and hear what he has to say. It should be an exciting event for sports enthusiasts and athletes alike, as it is not every day that someone gets to hear an Olympian share their story. If your company is interested in finding out availability and booking fees for a former Olympian like Hollis Conway, or other sports celebrities for a Keynote Speaker, Autograph Signing, Guest Appearance, or Sports Camp, call us at 1-888-246-7141.